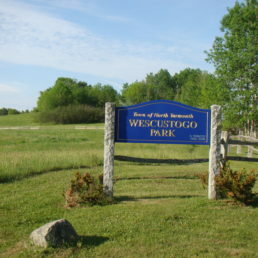 The Town of North Yarmouth owns and manages this small park off Route 231 (the New Gloucester Road) in North Yarmouth, on the banks of the Royal River. The park provides delightful meadows for picnics, and access for playing in the river with dogs, but no trails. Its hand-carry boat access ramp anchors river trips from upriver (from Penney Road in New Gloucester), or toward downriver destinations at Route 9 in North Yarmouth, or East Elm Street in Yarmouth. These trips are described on the Royal River Water Trail page.